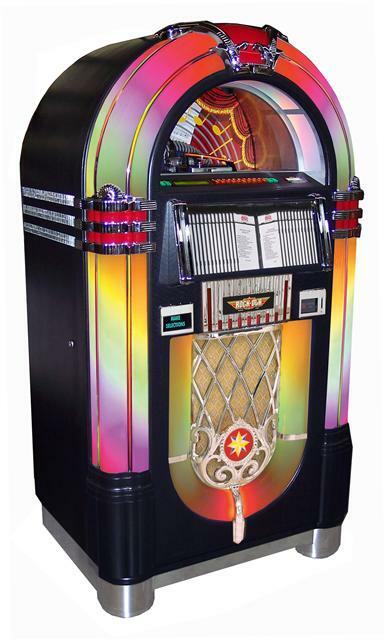 The most popular jukebox of all times has been meticulously reproduced in Rock-Ola’s Series V Bubbler. The Bubbles of air perk merrily to the top of the 8 bubble tubes, while a “Kaleidoscope” of colors flows through 4 color translucent plastic cylinders. It’s the 50’s all over again when the changer flips the CDs right in front of you. All 19 trim pieces are genuine die cast metal, triple-plated with copper, nickel, and polished chrome. With quality in mind, only the finest hardwoods adorn this beauty. The handcrafted quality of these classics is a tradition we proudly continue. Incredible sound quality with 5-speaker, dual 3-way system for "Live" performance reproduction.